Nail-biting is not only a bad habit, it is making your nails ugly, and can be deadly. Luke Hanoman, a father of two, developed sepsis and nearly died all because of a small cut on one of his fingers caused by biting his nails, reports The Sun. 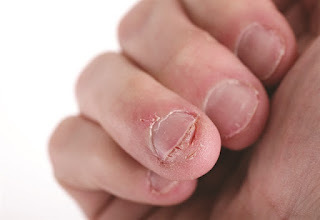 “I used to bite my nails all the time. It was nervous thing,” the 28-year-old told the British newspaper. "And one day I bit the skin down the side of my nail. It hurt a bit but I didn’t think anything of it." Later that week, he developed some scary symptoms. He couldn't focus, he started having cold sweats, and he was shaking. His finger swelled up and began throbbing. At first, Hanoman thought it was just a viral infection and that he would be able to "sleep it off." When his mother came to check on him the next day, Hanoman had developed a high fever and red lines all over his body, which can be a sign of infection. His mother called the National Health Service, and she was advised to get her son to a hospital immediately. He spent 4 days in the hospital.